In an era of nanosecond attention spans and click & dump music listening habits, it takes some brass neck to bring out a concept album. 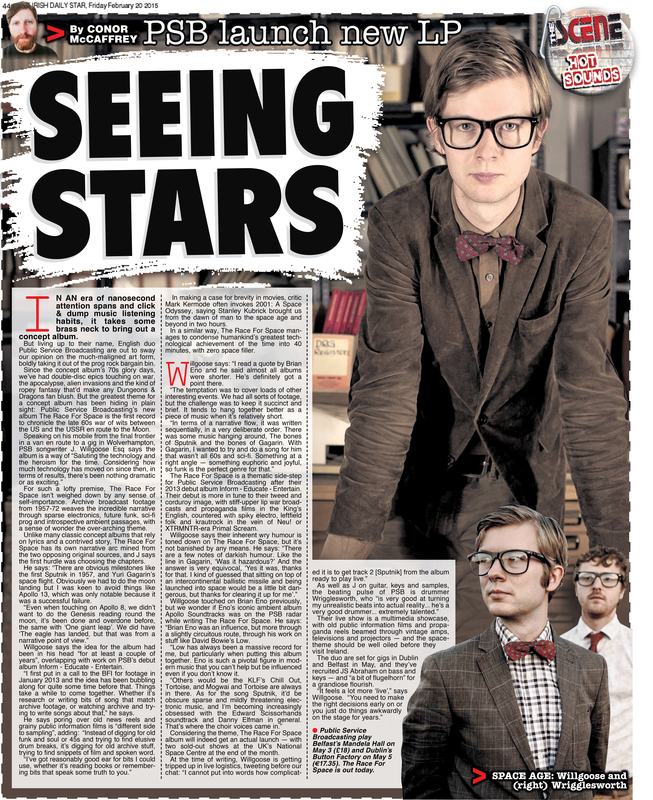 But living up to their name, English duo Public Service Broadcasting are out to sway our opinion on the much-maligned art form, boldly taking it out of the prog rock bargain bin. Since the concept album’s 70s glory days, we’ve had double-disc epics touching on war, the apocalypse, alien invasions and the kind of ropey fantasy that’d make any Dungeons & Dragons fan blush. But the greatest theme for a concept album has been hiding in plain sight: Public Service Broadcasting’s new album The Race For Space is the first record to chronicle the late 60s war of wits between the US and the USSR en route to the Moon. For such a lofty premise, The Race For Space isn’t weighed down by any sense of self-importance. Archive broadcast footage from 1957-72 weaves the incredible narrative through sparse electronics, future funk, sci-fi prog and introspective ambient passages, with a sense of wonder the over-arching theme. Unlike many classic concept albums that rely on lyrics and a contrived story, The Race For Space has its own narrative arc mined from the two opposing original sources, and J says the first hurdle was choosing the chapters. Willgoose says the idea for the album had been in his head “for at least a couple of years”, overlapping with work on PSB’s debut album Inform – Educate – Entertain. “I first put in a call to the BFI for footage in January 2013 and the idea has been bubbling along for quite some time before that. Things take a while to come together. Whether it’s research or writing bits of song that match archive footage, or watching archive and trying to write songs about that,” he says. In making a case for brevity in movies, critic Mark Kermode often invokes 2001: A Space Odyssey, saying Stanley Kubrick brought us from the dawn of man to the space age and beyond in two hours. In a similar way, The Race For Space manages to condense humankind’s greatest technological achievement of the time into 40 minutes, with zero space filler. The Race For Space is a thematic side-step for Public Service Broadcasting after their 2013 debut album Inform – Educate – Entertain. Their debut is more in tune to their tweed and corduroy image, with stiff-upper lip war broadcasts and propaganda films in the King’s English, countered with spiky electro, leftfield folk and krautrock in the vein of Neu! or XTRMNTR-era Primal Scream. As an Englishman in his early 30s, Willgoose would have first-hand memories of the sinister public information films of the late 70s and 80s, a Britain of dirty browns and greys, with atonal electronic soundtracks and kids falling through cracked ice or electrocuting themselves on power lines. It’s an era that’s been mined by artists like the Advisory Circle and Belbury Poly on the Ghost Box label, that prey on a collective dread and fear, and other hauntology acts tapping in to this unique English surrealism. Willgoose says the decision to embrace older footage and reports was aesthetic, but also due to a “residual terror” of the 80s films, adding: “I do remember being shepherded into the assembly hall and watching these horrible films and thinking, ‘Jesus I’ll never play with a frisbee near an electric pylon again’. Also, I like the objectivity with the passage of time and the perspective it gives to these songs. Possibly something to do with the sound of it on a sonic level, I really love the character of the voices back then and how evocative they are, it gives the music a different dimension. I kind of feel with 80s public information films, it’s almost too soon to be using , unless we actually worked our way up to the 80s, which in some ways we are I suppose. As well as J on guitar, keys and samples, the beating pulse of PSB is drummer Wrigglesworth, who “is very good at turning my unrealistic beats into actual reality… he’s a very good drummer… extremely talented.” Their live show is a multimedia showcase, with old public information films and propaganda reels beamed through vintage amps, televisions and projectors — and the space-theme should be well oiled before they visit Ireland. The duo are set for gigs in Dublin and Belfast in May, and they’ve recruited JS Abraham on bass and keys — and “a bit of flugelhorn” for a grandiose flourish. Thanks for following The immortal Jukebox Conor. I hope you will much to entertain you (and comment on!). i look forward to exploration of you r blog. Regards Thom. Cheers Thom, a fellow Bryan Ferry fan passed on your Bride Stripped Bare piece. Looking through your archives I’ve a world of good posts to check out. Happy days!